As marketers look to make more of their data, music streaming giant Spotify shared how it is taking people’s habits on the platform and turning it into actionable insights. While many organisations struggle to corral and verify the data for their customers, streaming platform Spotify has the opposite problem – how to make the most of a lot of verified first person data. Globally the streaming platform has now passed 140m users, all of whom have to be registered and logged in to use the service, with every one having a unique experience courtesy of the music they choose to listen to. As Richard Frankel, the global creative director of Spotify, told the Mumbrella360 conference: “We have moved beyond demographics to reflect the person behind the device. It’s one thing to know who your audience is, and another to understand them. And when you intimately understand them, that’s when you can dynamically evolve effective marketing strategies. This data has allowed the company to map how users behave on the app and build out new products and services. However, Spotify believes they can also start to predict the future behaviour of these users, by using it to determine their personality type. One data set they are dabbling with is the Discovery streaming habits on the service, which measures how much users listen to new music and how willing they are to hear things they’ve never heard before on a daily, weekly or monthly basis. The second facet they are looking at is the diversity of music people listen to. “That measures the range of music you’re listening to and measures things like genre and tempo,” explains Frankel. “Listening to music from a wide variety of genres makes you an eclectic, and listening just to soul music or jazz you’re a loyalist. The next element of listener behaviour being investigated by Spotify is one they have invented, called Tilt. Frankel explains: “This measures how much people are actively curating their streaming experience. Think about the way you tend to listen, do you lean in, are you curating your music? “Curators have the app in the foreground and are manually controlling the songs. If you just like to queue up a playlist, put the phone in your pocket and put the sound up and let it play you’re an Easy Goer. The streaming giant is also starting to investigate other facets of listening they think can help them map user’s personalities, including Nostalgia and Obsession. He also points to the Spotify for Brands website which already has some tools allowing marketers to deep dive on certain groups based on their musical habits. The brand has also started walking its own walk, using the data to help them “find our own voice” with their consumer facing marketing to attract new users to the platform. “We do a thing at the end of the year which is a bit of fun, it’s Your Year in Music,” explains Frankel. But the marketing team realised while that was a good tool for talking to everyone who was already on Spotify, those insights could also be used to create a bigger campaign, breaking down the areas of New York City and delivering some insights to them. “Instead of giving them this report we decided on an out of home campaign where we put up what happened in that place,” explains Frankel. 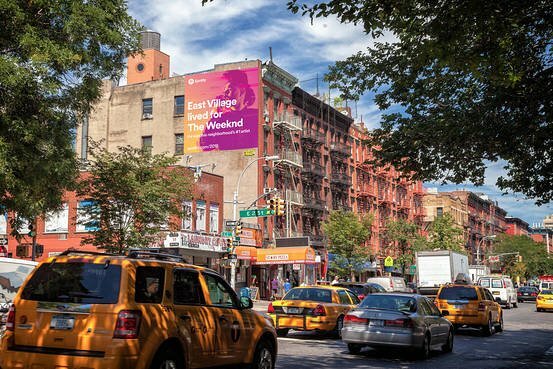 The insights showed things like artist The Weeknd being popular in the ‘cooler’ neighbourhood of the East Village, while the older neighbourhood of Soho saw Janet Jackson and Stevie Wonder as the most played artists. However the team hit the real insight when looking at ‘hipster Mecca’ neighbourhood Williamsburg. Frankel says: “Imagine our surprise when it turned out the most played song in this hip Mecca in the middle of New York was a Justin Bieber track Sorry. So we bought the largest single piece of outdoor real estate we could find and said ‘Sorry,not sorry Williamsburg. Bieber’s hit trended highest in this zip code’. “We were just being good reporters, making charts and graphs and reporting back as to this is who you are. And this was a way in for us, we suddenly thought let’s go beyond taking the musical temperature and start making some actual heat. This led to the idea for the team to “create culture in our own community and report on it”. It led to a much wider campaign for the brand at the end of 2016 which ran across several countries showing how the community was listening. In London the brand pointed out how many people had streamed ‘It’s The End of The World as we Know it’ on the day of the Brexit vote, while in Williamsburg someone listened to the song Broccoli 513 times, leading to the slogan: ‘We get it, you’re vegan’. While Spotify is only in the early stages of managing its unique pool of verified first-person data and detailed knowledge of how user behaviour it has already started to create insights to help advertisers on and off the platform. With more detailed analysis to come the streaming player may well have tapped into a rich source of data that will enable smart marketers to get deeper and more personal with consumers than ever before. Spotify is the world’s largest and most successful music streaming service of its kind globally. Find out more about about Spotify for Brands here.